Herein I invite you all to present your versions of Tour de Pologne route. This is Tour de Pologne 2018 edition the hard way. Ok, no Alps or Pyrenees in Poland, only Carpathian mountains, so it's not that hard but still more demanding than the original route. Nevertheless enjoy! "Wielki wyjazd" (Grand Départ ) as usually from the main square of the Old Town of Kraków (Cracow) in the medieval part of the city. Small hills of Malopolska (Lesser Poland) will allow the first fight for "polkadot" (in TdP it's rather magenta) jersey. The distance could be significantly cut from 150 to 124 km after Wysoka IV category climb. Back in Kraków the best sprinter will obtain the yellow jersey. Second stage will finish as always with a sprinter's show beside Spodek arena. Instead of boring laps in the urban areas the cyclists will tackle small hills of Kraków-Czestochowa Jura Upland so the active riders could get more KOM points. The riders will depart from Stadion Slaski, but will head again into picturesque Jura Upland to see parts of the Trail of the Eagle's Nests. Hills will be still not that demanding allowing cyclists to admire Ojców National Park with Ojców Castle, Pieskowa Skala Castle and Maczuga Herkulesa ("Cudgel of Hercules") limestone. The first uphill finish of the tour at yet another castle will be not hard, but due to narrow roads the positioning of the GC contenders in the front of the bunch will be crucial. The fourth day of racing will take Tour de Pologne into the mountains. After the start in Jaworzno, riders will head into Beskid Slaski, but the twist will be adding demanding Kocierz climb on the way south. Also instead of tackling both Zameczek and Sampol twice the peleton will climb these passes once but additionally will visit Koniaków and Kubalonka. If Primoz Roglic would be on such stage, he would see Wisla Malinka ski jumping hill where he used to fly in his previous sport discipline. Another twist in Szczyrk, where cyclist will pass the classic finish-line and climb almost 200 meters higher and 1300 meters further to Podmagura, as far as the asphalt allows. It's a pity riders cannot start in the beautiful salt mine in Wieliczka with dozens of statues carved out of the rock salt. Well, the depart will be only in front of the mine, and arrive will be in Bielsko-Biala as planned. The hills around Sucha Beskidzka will be fun (especially the 2-km dirt road part), but with Kocierz climb again on the way (but from another side) cyclists will wonder is it still only interval mountain stage or high mountains again. In fact the Przegibek pass will be that close to the finish that no sprinter will survive in front. Also the finish however still explosive will be further uphill. We all love Zakopane and Bukowina. Don't worry, they both will be on the way twice. The start will be somewhat lower in Nowy Targ, and riders will visit almost all the climbs of the Polish part of Tatra Mountains. The final will be in Kuznice, which will debut in Tour de Pologne. The climb will be not that demanding, allowing an explosive finish from the peloton reduced on previous ascents. If any rider would be disappointed with the altitude of the finish, there's a cable car that can take 1000 meters higher. The grand finale will be as in the previous years at the finish in Bukowina Tatrzanska. To offer something new the peloton will depart from Piwniczna-Zdrój and visit Slovakia on the way. Two HC climbs there will select the strongest before the climbs in Poland and the final battle on the last hill in Bukowina. Last edited by kubu on 29/08/2018, 14:53, edited 1 time in total. Tour de Pologne Uphill Frenzy! Another route for TdP starts in the capital of Poland - Carsaw. That's a more adequate name of Warszawa (Warsaw), as normally cars rule on multi-lane streets, racing with excessive speed towards next traffic lights. Fortunately professional cyclists wouldn't need to use mediocre, unsafe, inconsistent and generally inconvenient cycling infra and will use roads instead. The flat stage will feature three 4th category climbs, including two cobbled hills in the cities. The second stage would start almost on the finish-line of the fist - on Piotrkowska street, which is the longest street of Lódz. The flat stage would end with a first uphill finish of the Tour, however the light ascent would still allow sprinters to battle with punchers for the win in front of the famous Jasna Góra Monastery. The route to Bielsko-Biala is hilly at the very end, however no demanding climb (namely Przegibek) on the way. This will allow whole bunch to arrive to the finish-line, however the final ascent to Szyndzielnia would strongly favour punchers. Tour de Pologne without Kraków? That cannot be, the medieval capital of Poland pours enough money to the organisers to host the TdP at every edition. Depart traditionally on from the main square and after passing Wawel castle the riders will head south. The climbs around Rabka will only weaken the cyclist before the showdown after passing Niedzica Castle. The final climbs will embarass typical TdP routes in Tatra Mountains. A bit lighter hilly stage, but the steep short final climb is a real killer. The riders would pass Royal Castle in Nowy Sacz and finish close to Rytro Castle. Unfortunately the latter is a ruin, and the ascent there is not as steep as to Pomakowica. The penultimate stage will feature some of the hills from the previous two stages (Mlynne, Wysokie=Trzetrzewina), but the riders will climb them from the other side. The final wall, yet another gem of the region, would be a perfect opportunity to make up for the previous losses or extend the lead. Bukowina Tatrzanska hosts the TdP finishes since 2016, and the last mountain stage since 2010. This Tour would be no different. As the final ascent to Bukowina looks pale after the previous stages, the stage would use some Slovakian roads with HC climbs on the way. Welcome to another route of Tour de Pologne (BTW, it should be called "Dookola Polski", which means "Around Poland"). Here we have four of a kind of queens, as it is hard to pick only one Queen Stage. I tried to make the last four each marginally harder than the previous one. Kraków will host the Grand Depart again, but this time the cyclists will head north. Castles on the way are in Ksiaz (looks more like a palace) and in Checiny, honored by respectively intermediate sprint and a categorized climb. Before the sprinters' showdown close to Kielce's main square cyclists will manage one more fourth category climb. Second stage will start in front of the palace in Pulawy, where spectators will see a first intermediate sprint after a 10k loop featuring two bridges over Wisla river. Only climbs on the way are in beautiful small city called Kazimierz Dolny. TV spectators will enjoy medieval market square, the castle and the tower, but riders will have eyes set on cobbles that pave the road uphill. After two loops the peloton will head south to another gem of the region - Sandomierz, where sprinters will fight with Kwiatkowski as the finish is slightly uphill. The third stage will start with the loops on the cobbles of the old town of Sanomierz. The riders will tacle three slightly different ascents before heading south towards the hills. On the way they will enjoy views of castles in Tarnobrzeg and Baranów Sandomierski. 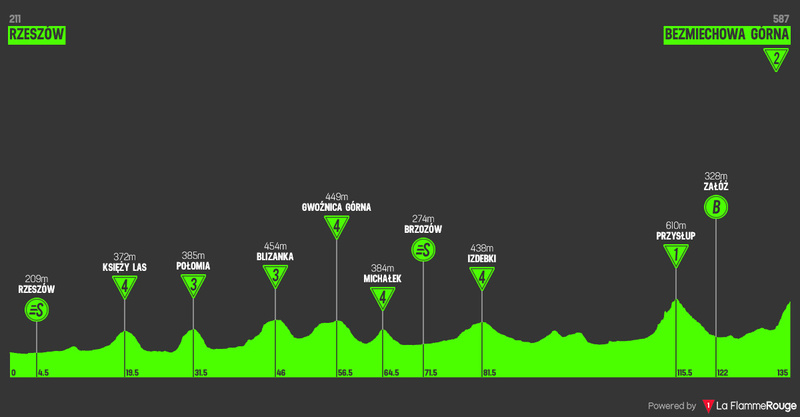 After Debica the hills will start and the outskirts of Tarnów will feature the first uphill finish of the Tour. This Tour will explore the climbs of Beskid Sadecki. First mountain stage will have mainly smaller hills on the way to the final climb in Wierchomla. There will be a dirt road on the way, and also the final climb is on a very good quality but still a dirt road. Who will be first on the Polish version of Colle delle Finestre? Depart from Piwniczna-Zdrój and the route would feature the penultimate climb (Palenica) of the previous stage but from the other way. After the ruins of Muszyna Castle the riders would go south for a short visit in Slovakia. After few moderate climbs around Krynica-Zdrój (Góra Piorun and Huta again) the final ascent, which gets steeper and steeper towards the finish-line, would be towards Barnowiec shelter. 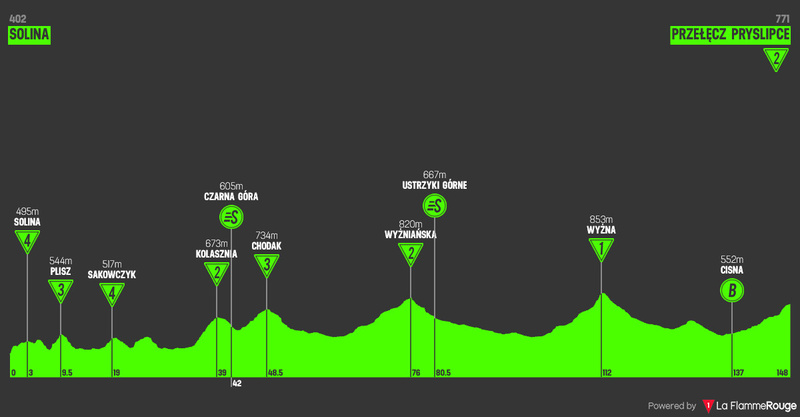 The last stage in Beskid Sadecki will explore not only climbs on a loop east of Nowy Sacz, but also castles around (in order of appearance: Nowy Sacz, Grybów, Nowy Sacz again, Stary Sacz, Rytro ruins). Most of the climbs in the first part of the stage will be useful mainly for collecting KOM points, but the final climb would be the hardest so far in this Tour. The Grand Finale will provide the opportunity to be a game changer. It will move the riders west towards old TdP friend - Tatra mountains. On the way two hard climbs before usual short climbs around Bukowina. To make it as hard as the previous stages the riders will pass the typical finish-line in Bukowina and cycle uphill towards Glodówka. Another Tour de Pologne, another depart from Kraków, but this time the cyclists will visit Bieszczady mountains in the south-east of Poland. The first stage is actually the same as in the edition described in the previous post. The cyclist will head north and pass castles in Ksiaz and in Checiny (honored by respectively intermediate sprint and a categorized climb). Before the sprinters' showdown close to Kielce's main square cyclists will tackle one more fourth category climb. Second stage will start in the old town square in Radom. On it's way to Lublin riders will pass Pulawy, where spectators will an intermediate sprint in front of the Palace. The stage goes through beautiful small city of Kazimierz Dolny. TV spectators will enjoy medieval market square, the castle and the tower, but riders will have eyes set on cobbles that pave the road uphill. The finish close to medieval heart of Lublin will be slightly uphill, but this would be still a battleground for sprinters. The third stage will start from Swidnik, a city known as a main centre of helicopter production. That explains the helicopter monument near the start of the stage. The route is almost flat and goes to the renaissance city of Zamosc. The mountain part of this Tour will start in Rzeszów. On the way south riders will tackle mainly smaller hills before two final climbs around Sanok. Przyslup pass will be the first major obstacle, and the final climb, however shorter, will be definetely steeper. Who will finish first in front of the Gliding Centre? Based on the vertical meters this will be a queen stage of the Tour. Depart from Sanok and the route would feature the penultimate climb (Przyslup) of the previous stage. Next major climb will be famous Zebrak pass. Cyclist will round the Solina lake before the final ascent to Jawor. The last stage in Bieszczady will use picturesque Small and Great Bieszczady Loop Roads. It must be considered and interval mountain stage. There's a number of categorized climbs on the way however the ascents, including final one to Pryslipce Pass, are long but not so steep. As the previous stages were not that hard, the Grand Finale will have to provide the opportunity to be a game changer. The stage would explore roads of Gorce - mountain range between Kraków and Tatry mountains. The first part might not be that impressive, but two steep climbs on Jasionów will decide who will win the Tour.